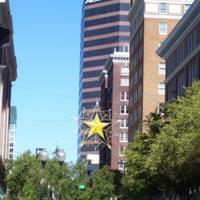 The holiday star located at the intersection of Central Boulevard and Orange Avenue in Downtown Orlando, Florida, in 2007. The holiday star tradition was started in 1955 by two department stores: Ivey's and Dickson & Ives. 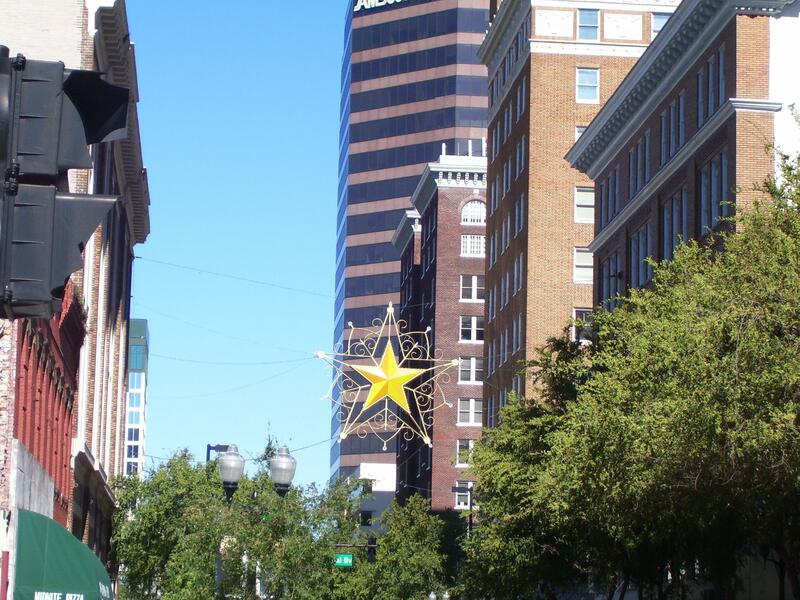 The stores hung a large gold-colored star from the southwest corner of Central Boulevard and Orange Avenue to the southeast corner. Wilson Reed, owner of Dickson & Ives at the time, is credited with the idea. The star used since 1984 measured 13 feet in diameter and weighed over 500 pounds. In 2005, the original was replaced by a more ornate star, which can be seen in this image. Original color digital images by Thomas Cook, 2007: Private Collection of Thomas Cook. Dickinson, Joy Wallace. 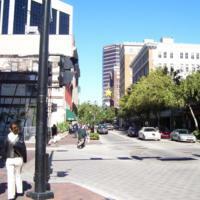 "Orlando History Shines in Orange Avenue Christmas Star. "The Orlando Sentinel, November 28, 2010. http://articles.orlandosentinel.com/2010-11-28/news/os-dickinson-florida-history-112810_1_peggy-reed-mann-orlando-proclamation-orlando-history. Cook, Thomas. “Orange Avenue Holiday Star, 2007.” RICHES of Central Florida accessed April 20, 2019, https://richesmi.cah.ucf.edu/omeka/items/show/2174.